Regretfully, Harry's Hofbrau has closed its doors for good. Special thanks go to their staff for supporting our club, Travis and Monica were especially helpful! Fear not, we have secured a new venue for our meetings! We will be meeting at the (Los Altos) Christ Episcopal Church. Address is 1040 Border Road, Los Altos, off hwy 280 and El Monte. Note new start time, doors open at 1:30. Google maps and directions below. Look for the SVAS signs and Parish Hall at the church. May 5 Event: Annual "Spring Fling", featured guests: You! (Photo from last years Spring Fling). Join us for an afternoon of music and fun! Performances will be by members as solos and in groups. 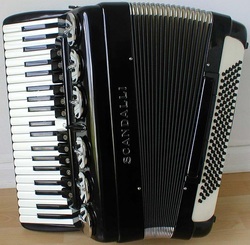 In addition, we will have a "massed accordions" event to celebrate World Accordion Day. We will play "Lady of Spain" as well as "Beer Barrel Polka" together (Like at the Cotati Accordion Festival)! Bring your accordion and sign up with Barbara Corsiglia, who will be coordinating the entertainment. Email Barbara at vic3458@pacbell.net to get on the playbill. Have some fun with other club members and plan a duet together! We are not catering a meal but light snacks will be provided. If you can bring a side dish, veggie plate, salad or dessert, we would very much appreciate it! Hope to see you there! Use your GPS but 280 is the closest highway. Exit on El Monte East, turn right on University Ave., University bends right and turns into Anita Ave., turn left on Border Road and the church will be on your right. Look for the signs and drive up the hill to the parking lot. Look for Parish Hall signs. Doors open at 1:30PM (note new start time), the program begins with a band of club members playing their accordions or a member playing solo. The door fee for members is $5, $10 for non-members, under 16 - no charge. 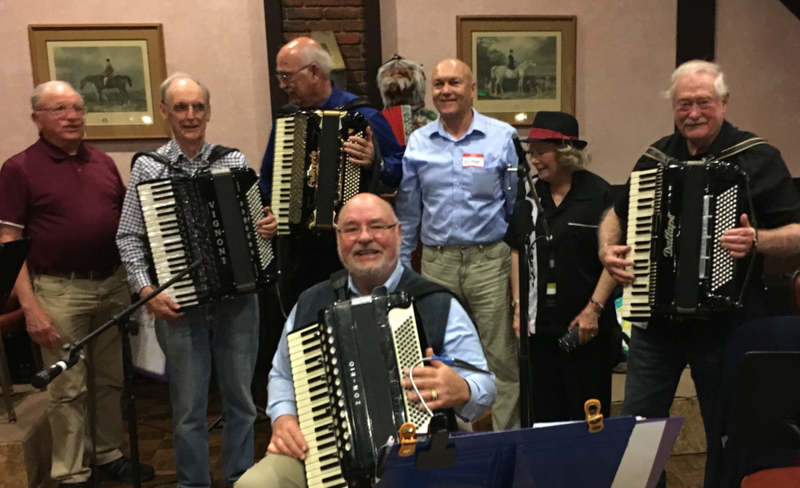 Bring your accordion and get on the pre-program by contacting Pam at pamk@svasociety.org. Our professional program begins at 3:30. We invite you to visit one of our meetings and listen to wonderful performances by our guests. Our members are more than happy to answer any questions you may have about SVAS and how you can join. We value your feedback; send us your comments and suggestions. By building an effective web site, we hope to get our message out to a larger audience of people interested in the accordion.